Shell Eco-marathon is a unique competition that challenges students to design, build and drive the most energy-efficient car. At three events around the world hundreds of team compete to travel the furthest on the least amount of energy. Some achieve distances equivalent to driving from Paris to Moscow (that's 1,544 miles) on a single gallon of fuel. The competition is split into two classes. The Prototype class focuses on maximum efficiency, while passenger comfort takes a back seat. The UrbanConcept class encourages more practical designs.. Cars enter one of seven categories to run on conventional petrol and diesel, biofuels, fuel made from natural gas (GTL), hydrogen, solar or electricity. After a year of designing, building and testing their vehicles, teams have just days to prove how far they can travel on the equivalent of one gallon of fuel. Cars drive a fixed number of laps around the circuit at a set speed. Organizers then calculate their energy efficiency and name a winner in each class and for each energy source. The Mater Dei Supermileage team began competing in the Indiana Mathematics, Science, and Technology Education Alliance (IMSTEA) statewide competition and has since progressed through the Society of Automotive Engineers (SAE) Super Mileage Challenge (2004-2008) in Marshal, Michigan. From 2007 to 2014 the team participated in the Shell Eco-Marathon Americas competition which was held in Houston, Texas. 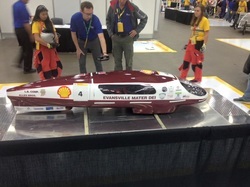 The Shell Eco-Marathon Americas is now held in Detroit, Michigan. In 2016 the team also participated in the Shell Driver's World Championship in London, England. Photo is from 2009 team who received first place with 1293.09 mpg in the Unlimited Class.